Does what it says on the box… takes no inputs and just changes all Sheet Names to upper case. Its been done so many times before, but most recently there was a nice easy workflow shared over on Evolve Lab. 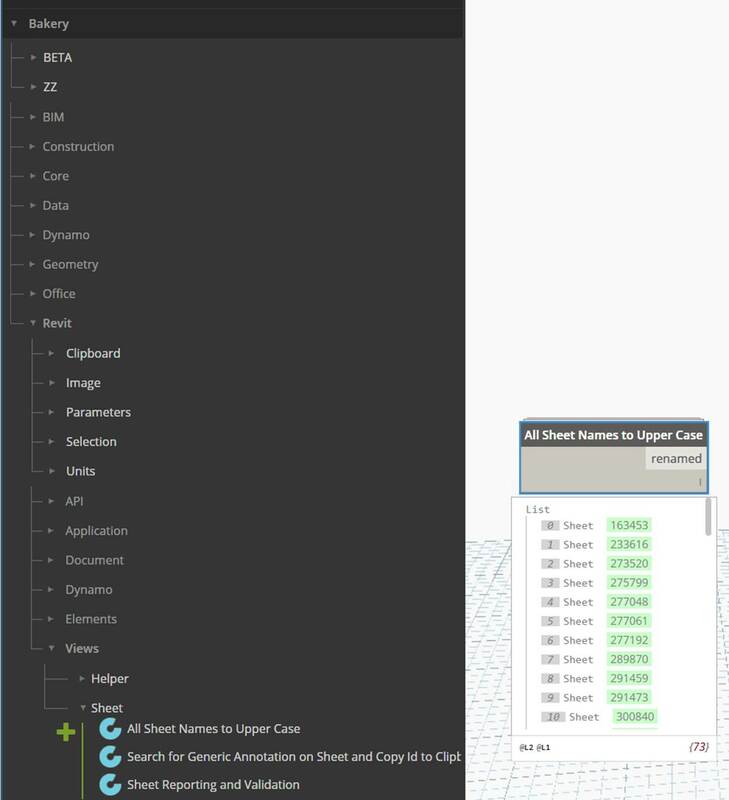 Interesting workflow posted by the EvolveLAB Team on their forum, showing how to batch print PDFs, driving Revit with Dynamo. Video and dyn links below. Created by Simon Moreau, DynamoMEP is a package for working with MEP elements, Rooms and Spaces. Note: These nodes are distributed in a dll, not as dyf files. Package published by Dale Harrison, InfraBIM. Refer to https://infrabim.wordpress.com/category/dynamo/ for more information. New Dynamo vodcast channel started by Bill Debevc and Ian Siegel at this link. 5 episodes so far. ModificationTracker.AllChanges Takes ExistingElements Data as input and outputs lists with all geometry/parameter values change combinations . Check out http://www.Data-Shapes.net for more informations . ModificationTracker.ModelComparison Compares elements from the current version of the model and a previous version (Current version is the current document by default) and returns existing elements data, new elements, deleted elements and a report. Check out http://www.Data-Shapes.net for more infos. ModificationTracker.ParameterChanges Takes ExistingElements Data as input and outputs elements with same parameter values and elements with changed parameter values. Check out http://www.Data-Shapes.net for more infos. RayBounce On Link Category Same functionality as raybounce but takes linked model elements of selected category into account. UI.Boolean input Creates a boolean input for UI.MultipleInputForm ++ . Check out http://www.data-shapes.net for more infos! UI.DirectoryPath Data Creates a DirectoryPath input for UI.MultipleInputForm ++ . Check out http://www.data-shapes.net for more infos! UI.DropDown Data Create data for DropDown input in UI.MultiInputForm ++ . Check out http://www.data-shapes.net for more infos. UI.FilePath Data Create filepath input for UI.MultipleInputForm ++ . Check out http://www.data-shapes.net for more infos ! UI.Listview Data Create data for ListView input in UI.MultiInputForm ++ . Check out http://www.data-shapes.net for more infos. UI.MultipleInputForm Create a form with multiple inputs. UI.MultipleInputForm ++ Create a form with multiple inputs. UI.SelectEdges Data Creates a Revit edge selection input for UI.MultipleInputForm++ . Check out http://www.data-shapes.net for more infos! UI.SelectFaces Data Creates a Revit face selection input for UI.MultipleInputForm++. Check out http://www.data-shapes.net for more infos! UI.SelectModelElements Data Creates a Revit element selection input for UI.MultipleInputForm++ . Check out http://www.data-shapes.net for more infos!